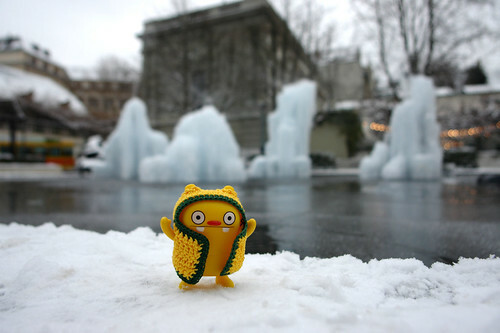 Uglyworld #283 - Jeero and the Fountain Ice Sculptures, originally uploaded by www.bazpics.com. Unlike Ice-Bat Jeero thought that the fountains weren't very interesting at all, and instead kept going on about how long we were spending their taking pics (and letting Ice-Bat enjoy the ice sculptures that the fountains had managed to make all by themselves. He seemed more interesting in finding the closest cookie store for some munchies.